Republican presidential candidate Ohio Gov. John Kasich apparently just scored a key victory in his home state. 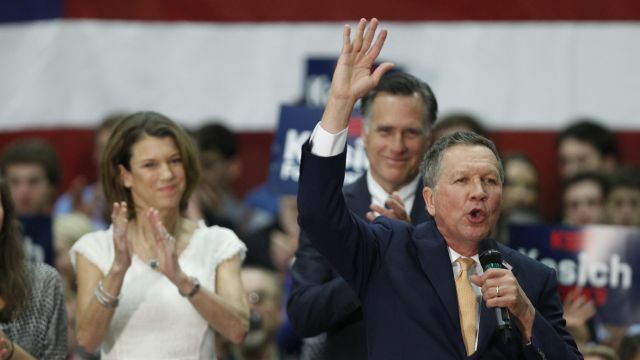 CNN reported on Tuesday evening that Kasich would clinch the Ohio Republican primary, scooping up all of the state's 66 delegates and marking the governor's first primary win of the election. The state was a must-win for Kasich, who is openly vying to win the nomination in a contested convention, and said he would drop out if he did not win his home state. Kasich's victory also makes Trump's path to securing the 1,237 delegates needed to claim the nomination somewhat more difficult. In the days leading up the primary, polls showed Kasich running neck and neck with Trump in the Buckeye State. Trump campaigned hard in the state in the final days, canceling a Florida campaign event Monday night and scheduling a rally in Ohio in its place. After months of largely ignoring the governor, Trump also escalated his attacks on Kasich,hammering him for supporting the North Atlantic Free Trade Agreement and taking a more measured stance on immigration reform. "Ohio is losing jobs to Mexico, now losing Ford (and many others). Kasich is weak on illegal immigration. We need strong borders now!" Trump wrote in a Tuesday tweet.